The worldwide debut of Sabre Yachts newest model, the Sabre 66 Dirigo, took place at the 2016 Yachts Miami Beach show. The Sabre 66 Dirigo is the first and only Downeast style motoryacht of her size built in the United States. The Dirigo model features an innovative Kevin Burns hull design, and iconic Sabre Yachts woodworking in her interior. In terms of the Sabre’s philosophy of Nautical Sensibility, she has been called its “highest expression” to date. She had an impressive sea trail amidst bitterly cold conditions. Thanks to a cutting-edge hull design and dual Volvo Penta IPS 1200s, the Sabre 66 Dirigo was able to achieve 30 knots in a remarkable 29 seconds, with time-to-plane coming in at an equally impressive 11.5 seconds. To finalize this modern triumph of Maine boatbuilding, this model boasts a cruising speed of 27.5 knots at only 67 gallons/hour fuel consumption, and a top-end speed of 32.5 kts. Beyond her dominate performance underway, the Sabre 66 Dirigo is infused with the same woodworking that has become synonymous with the Sabre Yachts name. 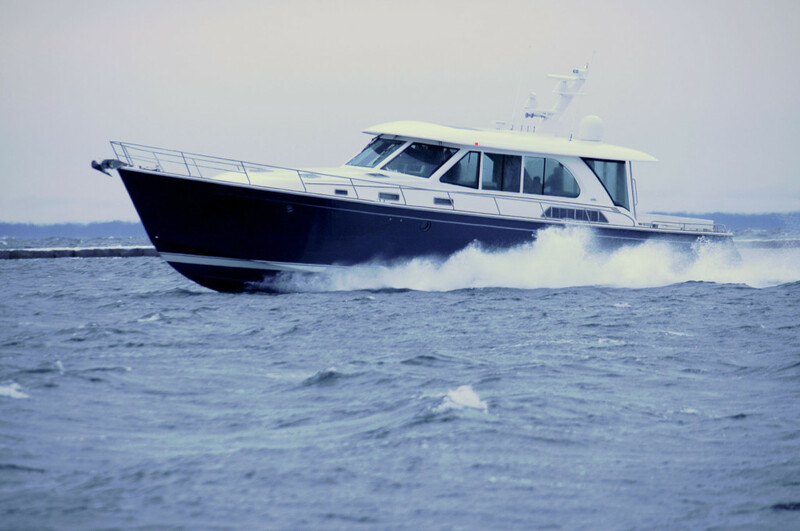 The company considers this new flagship the direct result of their more than 45 years in the industry and the dedication of Maine crafts-people with decades of boatbuilding experience. Despite frigid temperatures and uncertain weather conditions, the Sabre 66 Dirigo left Rockland Harbor on her maiden voyage early Monday morning, a journey that will conclude in Miami Beach, Florida where she debuted worldwide at the 2016 Yachts Miami Beach boat show. Market predictions expect the line to meet with huge success, and the company anticipates an increase in production-level openings as a result. To date, the Dirigo project has generated 20 new positions at Sabre’s production facility in Rockland, and hiring at that location continues. The Sabre 66 Dirigo is respectfully available by broker-accompanied reservation only. Given the yacht’s exclusive three-per-year production schedule, interested persons are encouraged to take advantage of this opportunity. Prospective buyers should contact their local Sabre Yachts Dealer, information about which can be found at the Sabre Yachts website, and media personnel are encouraged to contact the company’s main office in Raymond, Maine, to set up a viewing.